I mentioned last week how I'd finally gotten out my Micro-Mark resin casting materials (that I got, um, a while ago) and I thought tonight would be a fine time to finally break through and cast my first item. The first step in casting is to make a mold. But before you can make a mold, you have to make (or have available) a master that you want to copy - and a box to hold the master, and the RTV rubber you'll use to make the mold. Fortunately, I had a nice junk casting casting of junk on-hand to try copying and I have some experience making foam core boxes (click here for proof), so this was no problem. You can see the results above. Now came the tough part. . . I gathered all the materials Dave Frary recommended on the DVD included with the casting kit - and then went to open the first bottle of the two-part RTV (room temperature vulcanizing) rubber. Well, let's just say that it did not go well. At first I thought all of the liquid had evaporated, leaving just the white residue of Part A. But when I opened it, I discovered it had "just" separated. "No problem" I thought - "I'll just shake it back together again." No amount of shaking worked. So I decided to try and scrape it all out into a bowl to stir it back together. Yeah. Not so much. As you can see above, I had to cut the end of the bottle off to even get everything out. I finally got everything into a (thankfully disposable) bowl and stirred. And stirred. And stirred some more. After a while, I had to admit that no amount of stirring would fix what had separated. The lid had a couple of numbers on it - "9/15" - and although it didn't say so, I can only imagine that was the "Use By" date. I'd waited too long and it was far too late to do anything about it. Thank you again to all of you that expressed concern and offered up thoughts and prayers for my dad a few weeks ago. I'm very happy to report that he continues to heal well, there's no damage to his heart, and he's well on the road to recovery. Thankfully, I'll have some more time with him - and I plan to make good use of it. Unfortunately, now it's my father-in-law's turn. The Missus got some not-great news about her dad last night. We don't have a lot of information yet, and are waiting for some more tests to come back. But continued thoughts and prayers would be much appreciated. Hopefully, today's Tuesday Tip isn't too over the top. It should be no surprise that our hobbies - our passions - can often provide fitting metaphors for our lives. It's all too easy to wait and put things off until you think you have ideal conditions for doing what you've told yourself over and over that you'll do - soon, someday. Make "someday" today. Don't wait until it's too late - whether it's tackling that kit . . . or making that phone call. It's easy enough to go out and buy some new molding rubber. Make sure you don't wait too long to do the things money can't buy. First of all, I wanted to do a big shout out to my friend Bill Gill for redoing the banner photo. As I think I've mentioned before, I'm a bit color blind (which is why I'm so afraid of doing scenery....) but even I realized that the banner photo had a greenish cast - especially after I saw how great it looked after Bill fixed it! So THANK YOU Bill! You've made the blog as well as the Valley Local website just a little bit better. 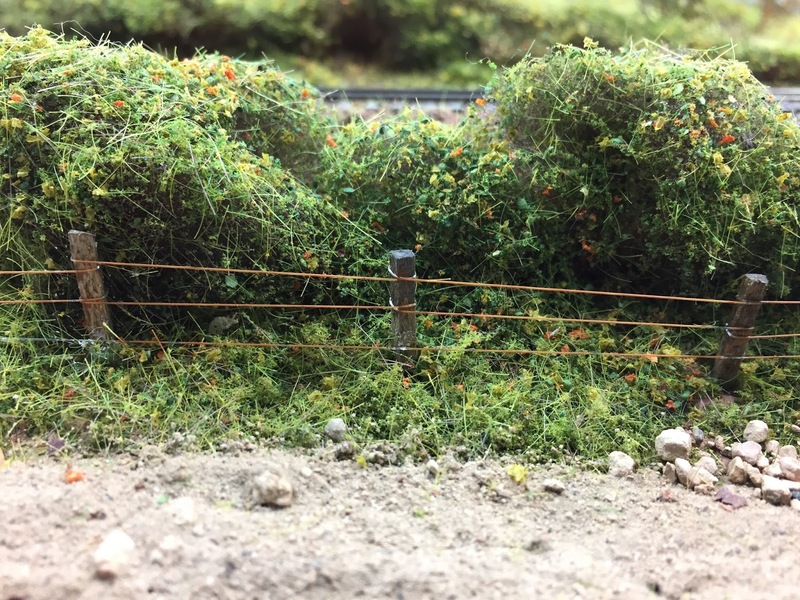 Bill hasn't been the only one working on the Valley Line though. Taking some of my own advice, I decided to do some more quick painting with the little bit of time I had after work tonight. . .
First, a little "writer's license".... 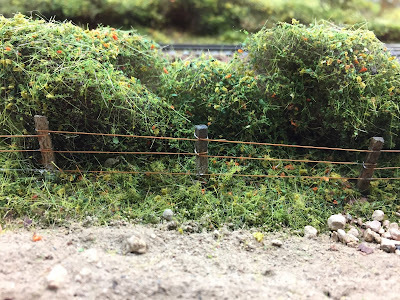 I actually painted the fence a little while back. But it was certainly another one of those quick, high-impact-for-the-time projects. 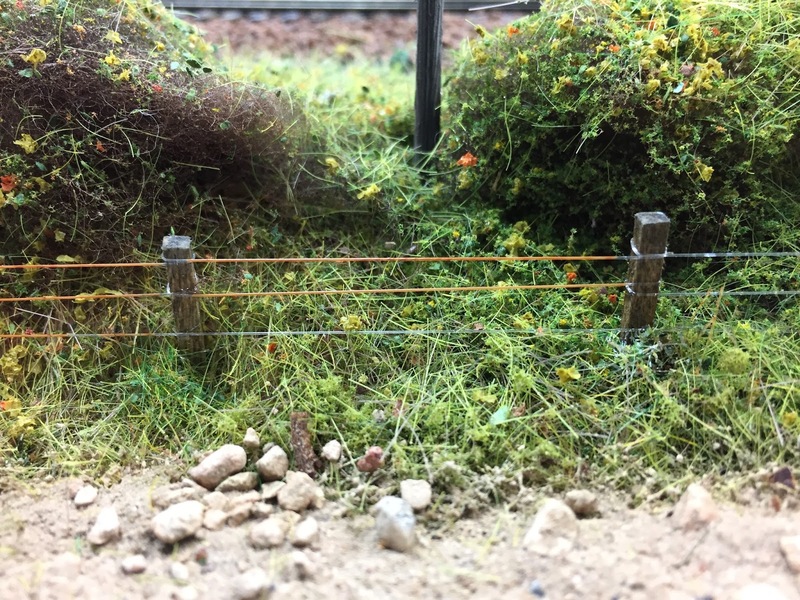 Just take a little "rust pen" (courtesy Woodland Scenics) and rub it on the barbed wire <ahem> fishing line . 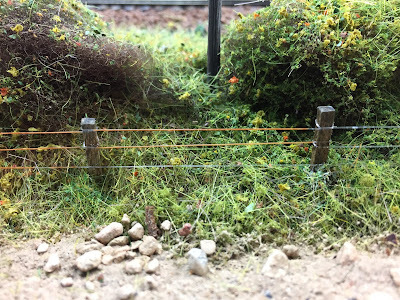 . .
BillS did the fence (and ground work, and bushes... but I digress) but I painted the line at least. And it looks pretty good. Certainly better than plain fishing line! So now for tonight's project . . . 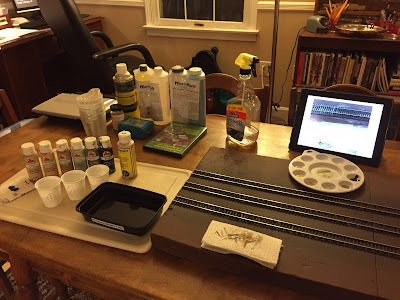 The Missus wanted to be up in the train room/den, so - after consulting an old blog post for what paints to use - I collected my paints and tools and brought my ballast/track test bed up to paint the ties. . . 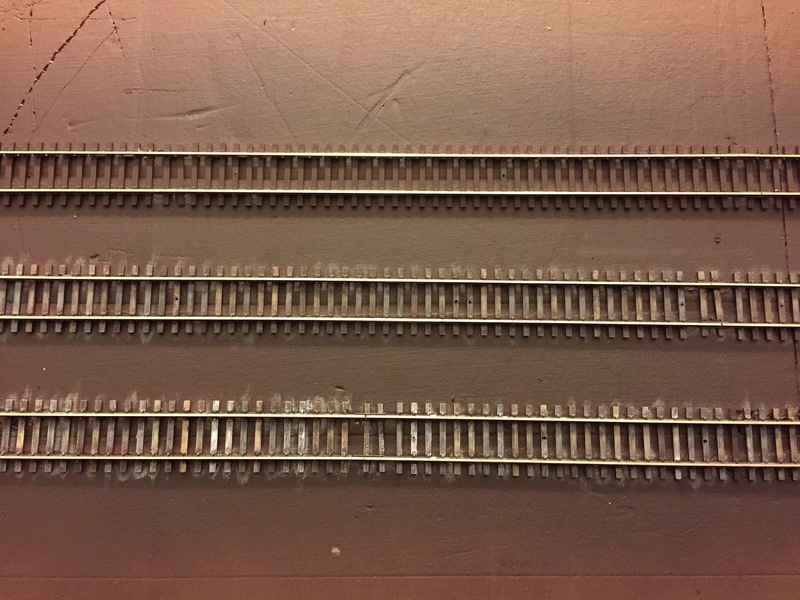 The plan is to treat the track on this test bed as I would on the layout. That way I can see the effect not only of weathering the ties (individually!) 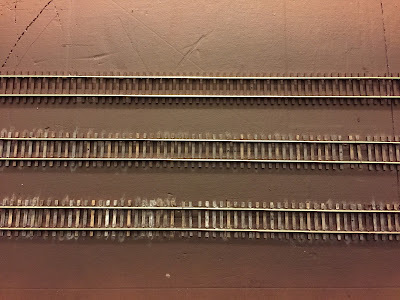 and whether the weathering will hold up under ballast and adhesive, but also how different ballasts themselves will look with and without weathered ties and with different applications of adhesive and stains. So you hopefully see above three distinct levels of weathering: 1) none (only spraybombed with brown paint), 2) relatively uniform. light weathering, drybrushing primarily two different colors, and 3) heavier, much more varied and heavier weathering using 3-5 different colors. 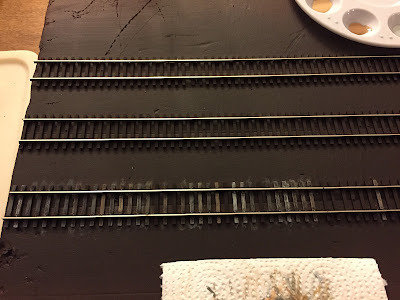 Having these three options will hopefully give me a much better idea of whether the weathering is worth it after I ballast, apply adhesive, and (probably) stain with either India ink/alcohol and/or a Minwax brown stain wash.
Wow - did Springfield already happen? It's been so nuts around here the past few weeks between family stuff and work stuff that it all just seems like a dream. Good thing I took pictures. Not much time for a show report. Or much else hobby-wise, unfortunately. I even managed to miss posting a Wordless Wednesday - a first, I think, sadly. But I've managed to do just a little bit this past week . . . I finally opened up the Micro-Mark casting materials that I got far too long ago (ahem, 3 years?!) with a view to ginning myself up to make some progress on the Rt. 15 overpass. All I could manage though was to watch the video. Dave Frary makes the whole process look pretty easy so I'm itchin' to try it out. Soon. Then I spread out the glue and stuck the track to it. And there it sat for most of the week since I'd run out of my my favorite brown spray paint (Rustoleum Camo Earth Brown) that I use on the track. But tonight, after another late night at work, I figured I'd swing by the store and spend a few minutes while waiting for dinner to heat up painting the track . . .
Now, I can't do anything until that paint dries, but at least it's painted. 15 minutes well spent. Which leads to the moral of this post, if there is one: Always try to do at least a little SOMEthing. It's a lesson that easily remembered but all-too-often forgotten. If you do nothing, you'll never advance. But if you do a little something - even 5 minutes worth - you're just that little bit further along. And anything hobby-wise is better than nothing.